The Lower Modernisms – 036. 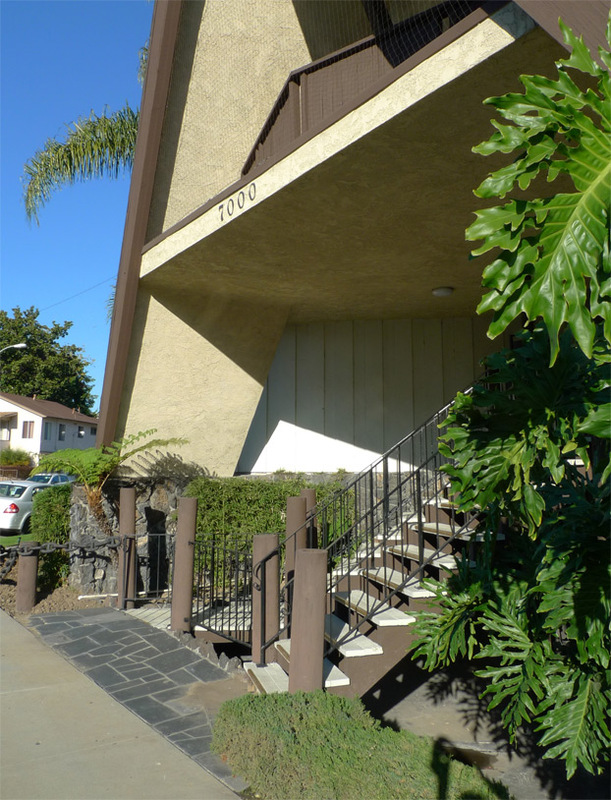 Lomo Featured Project: The Islander Apartments. Lomo Styles: The Polynesian Gabled. Lomo Building Types: Apartments. December 11, 2011 by James Black. Everything is there from Tacoburger Aztec to Wavy-line Moderne, from Cod Cape Cod to unsupported Jaoul vaults, from Gourmet Mansardic to Polynesian Gabled and even – in extremity – Modern Architecture (175-177). The term suits the Islander well, for it has many gables. The oblique angle at the corner of Evergreen and Inglewood is punctuated at its apex by an A-frame entry, a super-gable to rule all the other gables. As Banham noted in his description of Bellflower’s Tahitian Village (123), the derivation of these flying gables from actual Polynesian vernacular is slightly doubtful; this unrestrained and fantastical style took on a vivid life of its own. 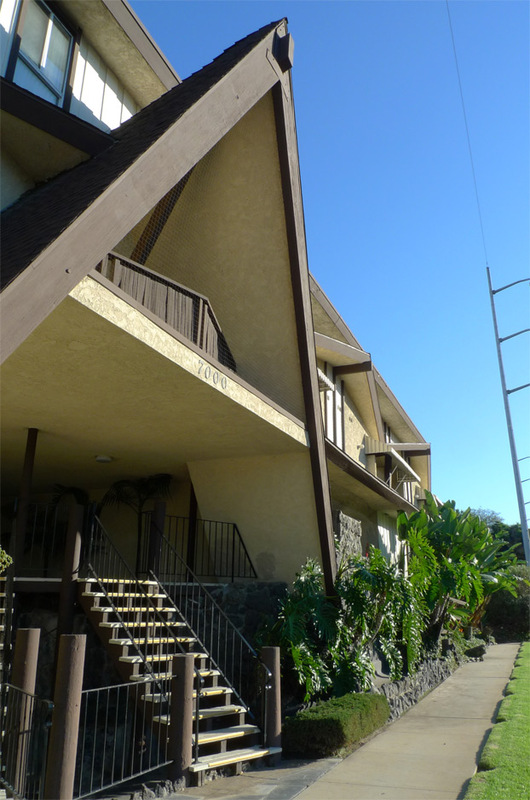 The A-frame form, ideally clad in shaggy cedar shakes, was an improbable stylistic link between the Ski-Lodge Moderne (see for reference the Green Valley Circle Apartments) and the Polynesian Gabled. 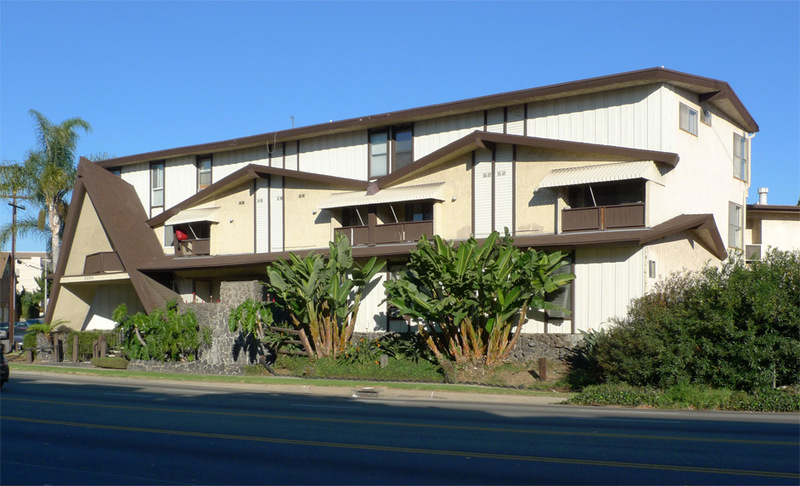 Both the Alpine milieu and the Hawaiian milieu represented vacation destinations; the A-frame served as a domesticated form of resort architecture in both cases, a pointy and triangular expression of the fantasy of living the vacation full-time at home. This building could have been a simple stucco box with some punched windows in it, and if you stripped off the accessories, it would be; but there is so much going on. The default condition of cement plaster is enlivened by decorative wood screeds painted in contrasting brown – these highlight the window openings and create vertical “racing stripes” beneath the tertiary gables applied to the front of the building. Wood siding, both horizontal and vertical and of two different scales, contributes to the lively texture. 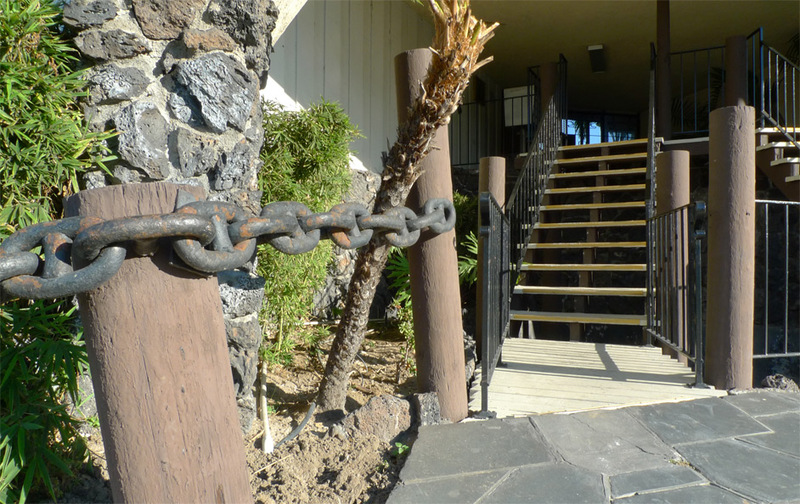 Lava-rock cladding gives a sense of weight and roughness to the base of the building. The roof was presumably shingled with cedar shakes in years gone by. The effect of these applications is to roughen up the smoothness of what could otherwise be a boringly smooth plaster building. The Islander Apartments’ texture fulfills the description offered by Banham of the Tahitian Village (a motel and restaurant complex): “a profusion of carved wood and rough hewn surfaces… buried in a positive green salad of impenetrable exotic evergreens (123-124).” The Islander’s grounds likewise are planted with the appropriate jungle specimens. The proliferation of gables serves the same imperative to roughen up the building – the gaze does not slide smoothly across the Islander’s walls. These elements emphasize the “Gabled” half of “Polynesian Gabled,” but the Islander is, in the strictest sense, doin’ it wrong. The roof has a real, bona-fide gable structure, but the walls below have sprouted multiple vestigial gables in all directions. These wall-mounted gables are clearly not an integral part of the building structure. In Venturi’s terms, a righteous gabled building would be a coherent three-dimensional form, a “Duck” building; the Islander is a “Decorated Shed,” or more accurately a Decorated Duck, insomuch as it features gables both authentic and applied. The A-frame, a soaring and dramatic element marking the Islander’s entry, evokes a nautical feeling, perhaps because its profile recalls the prow of an (upturned) ship. Structurally it is a real A-frame at least in part, to the extent that the roof framing is laterally braced by the ground to create a rigid triangle. The open-riser stair brings one up into this frame. The visitor enters a compressed, low-ceilinged space that enhances the sense of expansion into the courtyard beyond. These stairs pass over a moat-like pool (aka “koi pond”), sadly now drained. Visiting the Islander would have been a multi-sensory experience with the fountains in operation. According to a contributor in a discussion of the Islander on the Tiki Central website, a tall and dramatically lit tiki once stood sentry in the middle of the moat at the center of the A-frame. With its nautical-themed posts and iron chains and a bubbling, illuminated water feature, the Islander’s entry sequence was executed in the design language of miniature golf-courses and theme parks. It is a pity that the ownership (the Islander is now condominiums, in case you’re thinking of moving) has not maintained it in operation. Lately I have been wondering how long one would have to live in an architectural fantasy before the novelty wore off. Nice entry. I love this building. I have never really had any time to study it as I am usually concentrating on not crashing when I go by. The street views really make the building seem like a three dimensional composition of Polynesian-izing elements, though when looks at it from a bird’s eye perspective, you realize that the ‘architecture’ here is really only five or six feet deep on the La Cienega facing side, and that only the dog-leg bar facing the street even has a gable roof – the other two wings are just flat roofed stucco boxes. The complex does appear to have a very nice swimming pool composed of three interlocking circles of different sizes – in plan, it looks like a snowman bowing. 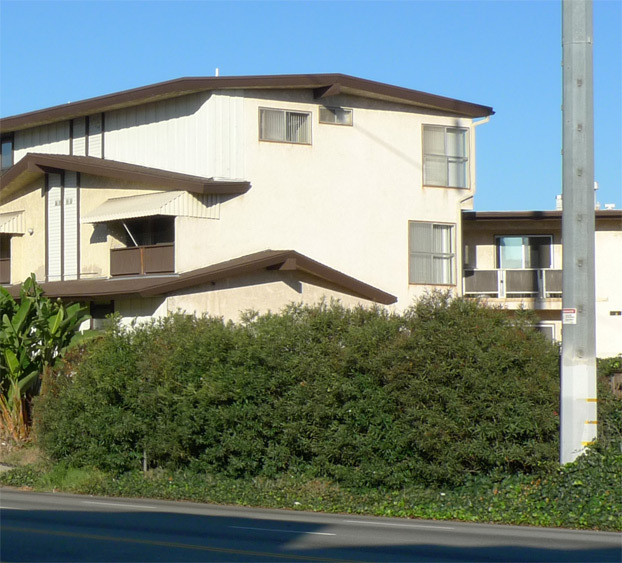 A much lower rent specimen, the Mona Kai, can be found at 4600 Sawtelle on the corner of Braddock, immediately across from the retaining wall of the 405. The plan is interesting, because you can tell that is basically just an L-shaped stucco apartment of the most utilitarian nature, with a Polynesianesque volume featuring an authentic, almost fully disengaged A-frame crammed into the negative space between the L and the irregular lot line along Sawtelle. These components could even be additions. There are enough similarities to the Islander that I wonder if they were put up by the same developer.